Dental Smiles > Blog > Dental Office > Where can I find Austin dental implants? Tooth loss is a widespread oral health problem that has afflicted people around the world throughout history. Even George Washington suffered from edentulism (although contrary to popular legend his false teeth probably weren’t made out of wood!). Tooth loss can be the result of a variety of injuries and health issues such as gum disease, dental decay or trauma, and it can have a hugely negative impact your health, self-image and overall quality of life. Fortunately, at Dental Smiles we can recreate the look, feel and function of natural teeth with customized 78723 dental implants. 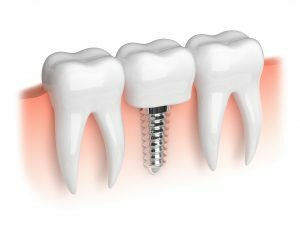 Dental implants represent the most advanced solution for the replacement of missing teeth, and have helped countless patients reestablish beautiful, complete smiles. An implant, made of biocompatible materials, fuses with your jawbone to support your replacement teeth. The implant acts as an artificial tooth root, providing stimulation to the bone to help preserve it. An individual implant can support an individual crown, just like your tooth root supports your tooth. Implants can also anchor a customized fixed bridge or stabilize a removable overdenture. Dental implants can let you again enjoy a varied, nutritious diet and smile and speak with renewed confidence. With a 98% rate of success, 78723 dental implants are a predictable, permanent solution for replacing missing teeth, and patients living with dental implants report feeling satisfied with the results of treatment. At our office we offer a comprehensive range of services and use the latest state-of-the-art equipment as well as most advanced methods of care to provide the highest quality of dental services. Dr. Divya Shetty and her team are experienced in providing the precise, skilled care required to regain a full, beautiful smile. Give Dental Smiles a call to find out more about 78723 dental implants today!